Ever stopped and thought about what you're typing several times a day at the command prompt? 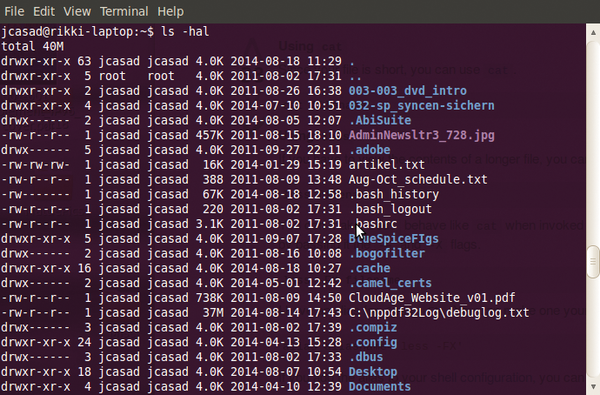 Many experts prefer the Bash command prompt for its versatility, speed, and convenience. However, users often stick with a small collection of commands without realizing the full range of possibilities available through the very expressive Bash shell. In this article, I will describe a few of my favorite tricks. You might already be using some of these techniques, and some might be new to you; in either case, I hope this article encourages you to explore the advanced capabilities available through Bash. At the end of a long day's work, I recently found myself staring at the command line and wondering where a certain command originated, namely the ls command. I wouldn't want to hazard a guess at how many times I run the ls command everyday. With those bleary eyes, I realized that I'd been typing this command for more than 20 years with little knowledge about it, other than it essentially meant list. For something so succinct, the all pervasive ls command is not only greatly understated but also commonly taken for granted. According to folklore, the ls command originates from a project that began in 1964 in Cambridge, Massachusetts called Multics (Multiplexed Information and Computing Service), which, among other things, influenced the architecture of the undisputed heavyweight champion of operating systems, Unix. ls was included in the original version of Unix from AT&T Bell Labs. On the premise that Unix and its ever-popular relative Linux are based around listing files and working within a current working directory structure, it's clear why the ls command was developed. As compact and bijou as the ls command is, it can do much if you become familiar with its many useful command-line options. Figure 1: Add -hal to the ls to display all files with long-format permissions and file sizes in human-readable form. Some, especially older, Linux distributions lack color when outputting information, and with the amount of information and detail that most sys admins need to wade through on a daily basis, color-coding is all but essential in order to work effectively. Your file and directory listings should now be far easier to read. Now that you are staring firmly into the powerful but somewhat abyss-like .bashrc file, I would be remiss not to mention the following lifesavers. Yes, you're quite right that the preceding .bashrc entries ensure you'll be prompted before overwriting or manipulating a file. This precaution can save your life; especially if you're typing at a breakneck speed. Bash will force you to pause for reflection before deleting that all-important single copy of a file.